Habitués of City Weekly’s glamorous rooftop smoking lounge have a front-row seat for the many attractive sights and sounds provided courtesy of the 222 S. Main high-rise construction site. 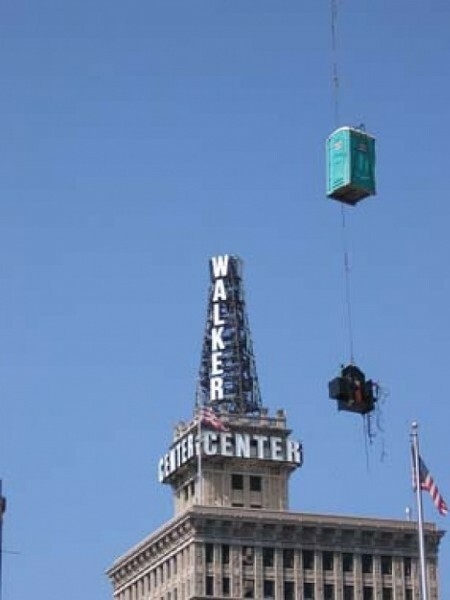 Monday’s program was the best yet: a Port-a-John actually flew through the air, describing a graceful arc as it crossed in front of the Walker Center weather tower, suspended by a cable from the arm of the site’s very tall crane. As we draped our designer-clad figures in languorous poses upon the smoke-filled lounge’s velvet upholstery, tinkling laughter broke out at the spectacle. Having never witnessed such a sight, our guess was that it was a particularly witty practical joke on the john’s hapless occupant.